Montmartre in Paris is a magical place, the hill is visible from almost anywhere in Paris and the basilique is a constant reminder of what architectural beauty is. Aside from it’s spiritual reminder that there is more than just today and this instant. But now we’re entering a wholly different subject which this blog isn’t about. I took this photo from a funny angle, funny because very few Montmartre pictures (HDR or otherwise) are taken from the north east side. The majority of the pictures of the hill are taken from south west. It’s not a huge difference for you, unless you’re a bit into it but the tower in the back is often hidden. While this isn’t a recent picture I found it when I was working on my light writing image and was putting some order in Lightroom files. I took it at the same time as I took the Paris Panorama with the Eiffel Tower and Sacre Coeur. The Basilique of Montmartre hill in Paris seen from the north east side of Paris. I edited the photo quite a lot as it was just not interesting enough when it came out of the box. Of course I had shot it dead-center so I re-cropped it. Then I retouched it in Lightroom quite a bit to recover as much as possible (it’s not HDR’d) and once done there I took it into Topaz adjust and turned it to black and white, adjusted the exposure and plenty of other stuff. The buildings in the foreground either had to be totally underexposed and thus all black, or the way they are now, any other adjustment just doesn’t work. In B&W they are interesting whereas in color they look off. The Paris rooftops are quite photogenic when turned to black and white. I quite like the edit and hope you like it too. PS: For Valentine’s, Sacre Coeur is probably the most romantic place in Paris. But then again not too difficult to find great places in Paris. 13 Feb	This entry was published on February 13, 2013 at 10:27 pm. 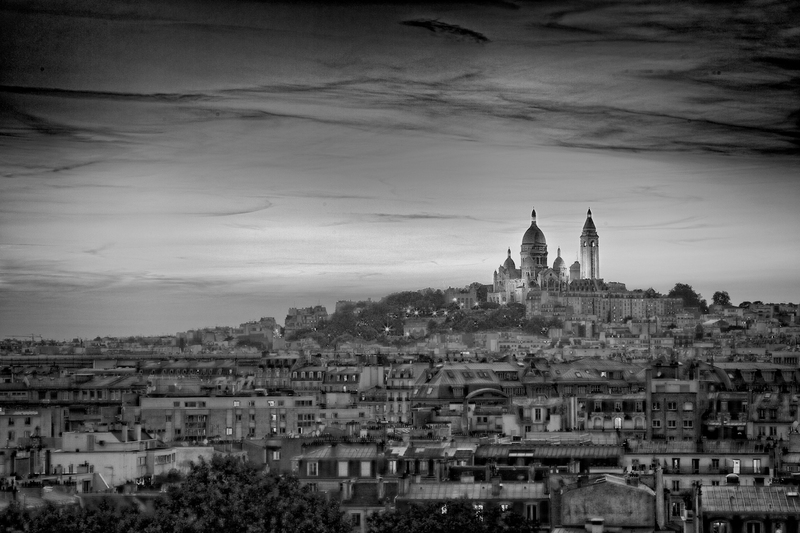 It’s filed under Autumn, black and white, Buildings, Canon 5D Mark II, Landscape, Monument, night photo, non-HDR, Panorama, Paris, Parisian Classic, photography, Sunset and tagged basilique, black and white, cityscape, montmartre, Monument, non-HDR, photography, romantic place, sacre coeur, Sunset. Bookmark the permalink. Follow any comments here with the RSS feed for this post. Printemps a great place to take photos of Sacre Coeur, I like the street scenes from there as well. I often sit up there in good weather to draw or take pictures. I think this is one of the most beautiful photos of sacre-coeur I’ve seen. I am so in awe of this serene place and it holds such a powerful yet peaceful presence. Seeing this photo reminded me of that feeling! I am interested in buying a print of it. However, I didn’t see it on your gallery? Is it possible to get a print of this? Thank you! Much love from Phoenix, AZ!